Today Deb and I celebrated our 30th anniversary. We went back to our original honeymoon night place. Zion National Park. 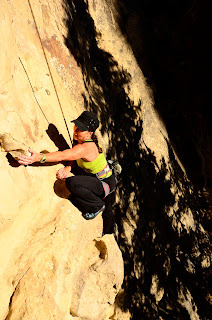 I had plans to rock climb and then do a canyon together in addition to dining at one of our favorite restaurants, Oscars. The weather changed our plans a little. An unusually steady wet weather system left over from a tropical storm down in the Baja of Mexico pounded the region with lots of rain and flash floods in the canyons. We witnessed a flash flood in Pine Creek canyon as we looked on under the bridge by the tunnel where we usually start our rappels in that slot. We did get in some rock climbing and our dinner at Oscars. Then today we hiked to the top of Lady Mountain. The "trail" up that mountain is only known to a few people as it was dismantled more than 50 years ago by the park service. It used to have lots of iron chains. Now we rope up for a few precarious sections, but we are still able to follow the many cut steps in the stone up that steep trail. The view on top is spectacular. It took us 6 hours to complete the hike. Obviously we had the route to ourselves. This evening we had our children and grandchildren over for some cake. Deb and I are so blessed with such a great family. We hope the next 30 years are just a great! Deb finally agreed to lead a climb today. We were climbing at the Fly Trap at Veyo and I had just completed two laps on Hopscotch a 5.12b climb and needed to rest for a bit when Deb suddenly suggested that she was thinking about leading the 5.7 climb named Fly Soup. I took a few minutes to go over clipping draws with her right or left hand and how to avoid back clipping. She then jumped on the climb and methodically lead her way up clipping the draws with confidence. No problem. Wow! I didn't think this day would every come. I was surprised. 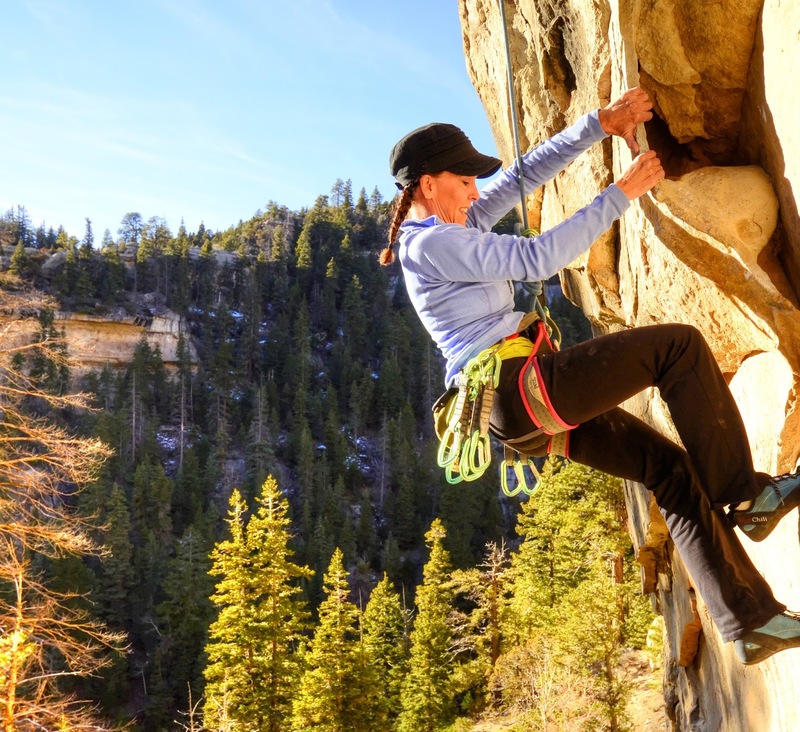 Deb is fifty years old and has been climbing regularly with me for a couple of years now. Way to go Deb!! On Monday Eric & I drove north in my truck. We stopped in Midway to find Grandma & Grandpa's place crawling with young grandkids. This included a new batch of 8 puppies! The next morning we completed our drive to Jackson Hole, Wyoming. We met up with my ranger friend, Andrew. We then did some rock climbing for a few hours before spending the night at a ranger's place at Grand Teton National Park. In the morning we loaded our packs and began the hike up to Garnet Canyon on the south flanks of the Grand Teton mountain. The weather had been great for weeks up in that area, but the forecast called for rain and thunderstorms to begin the following day. Because of this, we hastened our trip up the mountain and after dropping our packs at the Petzholdt Caves area we continued up to the Lower Saddle. We then climbed the Grand via the Upper Exum Ridge. I had once again intended to climb the peak via another more challenging route but once again my plans were thwarted. This time because of a threatening weather forecast. So late in the afternoon (at 6 p.m.) I stood on the summit of the Grand for the fifth time. Eric stayed with us until just before the technical climbing began. There he ran out of energy and was quite dehydrated. He waited there for us to come down. The day was long, sunny and quite warm for the mountains. When we finally stumbled back into our camp at the Caves it was nearly 10 p.m. We had been on the go for over 12 hours with less than an hour total of rest with a vertical gain of 7,000 feet. It was one of the hardest days in the mountains that I have ever done. My freeze dried dinner never tasted so good! The following day the weather held out until evening so we were able to climb Irene's Arete. 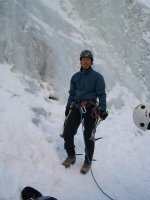 A wonderful technical rock climb on a lower buttress of the mountain. That climb took us a little over 6 hours. The early arrival to our tents was welcome as I still had not completely recovered from the previous days push. We had plans to climb another route the next morning but were rebuffed by morning rain. Therefore, we packed up our tents and gear and hiked off the mountain. Eric & I then made our way back to Midway where we spent the night. Saturday morning before driving home to St. George, Eric and I, helped Grandpa with some yard work. Midway was cool and green and inviting on that summer day. I enjoyed traveling with Eric this trip especially because he could now share the driving time. He was a also a great help to Grandma & Grandpa.